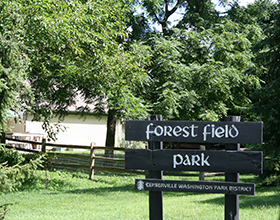 Community-directed improvements are coming to Forest Field Park! A favorite site for hikers, picnickers and tennis players, the 44-acre community park is adjacent to Bill Yeck Park, a 194-acre nature park. In addition, it is the central practice site for all Centerville United Soccer Association teams and a practice site for Centerville Recreational Soccer. In 2016, the Park District invited park users and neighbors to participate in a design meeting to discuss park improvements. From that citizen input, a draft design emerged. Citizens were invited to give comment and suggestions. The final design reflects the input of the neighbors and park visitors. The revived park will feature new, flushable restrooms; a new playground; a nature play area; connections to Bill Yeck Park; an all-accessible paved path loop; and, another 3/4 mile of soft surface trails. A picnic-grade backstop will be added for family softball, kickball or whiffle ball. Entering the park will be easier with a walkway extending from Centerville Station Road. Finally, the park will get additional facelift with more trees, pollinator gardens and other landscaping. Work is ongoing. The paved path and restroom building are expected to be completed by the end of this year. Work on the playground will begin in the spring.